We work with DKHT to deliver their flagship Get on Track programme, which is aimed at young people aged 16-25 who are facing disadvantage. Book a place now for Easter holiday camps for dodgeball or basketball! 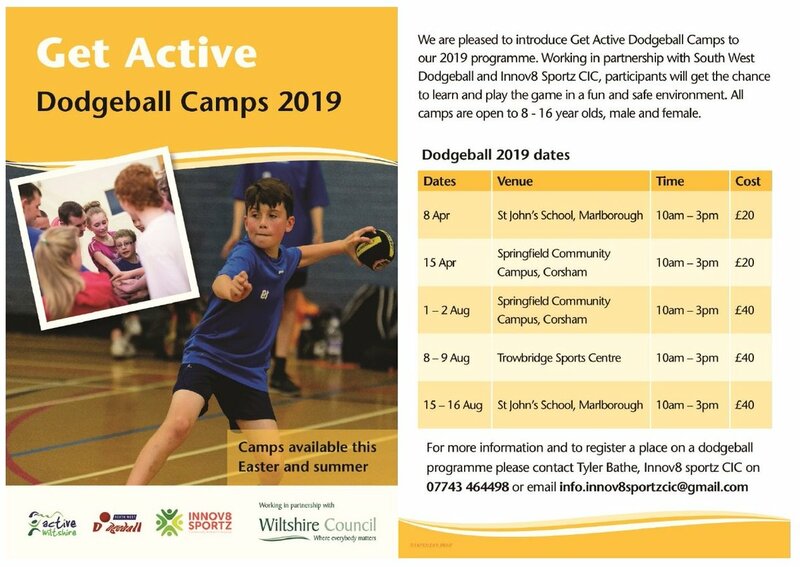 Dodgeball and Basketball holiday camps available across Wiltshire this Easter and summer! These events take place in pleasant parkland surroundings and we encourage people of every ability to take part; from those taking their first steps in running to Olympians; from juniors to those with more experience; we welcome you all. Using the events page, select the event you are most interested in and review all the information about the course, local news items, the photo gallery and information about volunteering. Also, take a look at the extensive results page where you will find an incredible amount of information about your past performance. When is it? Every Saturday at 9:00am. Where is it? The event takes place in Monkton Park, Chippenham, Wiltshire, SN15 3PA. See Course page for more details. What does it cost to join in? Nothing - it's free! but please register before your first run. Only ever register with parkrun once. Don't forget to bring a printed copy of your barcode (request a reminder). If you forget it, you won't get a time. Chippenham parkrun needs you! It is entirely organised by volunteers - email chippenhamhelpers@parkrun.com to help. Where is it? The event takes place at King George V Park, Melksham, SN12 7ED. See Course page for more details. Melksham parkrun needs you! It is entirely organised by volunteers - email melkshamhelpers@parkrun.com to help. Where is it? The event takes place at Churchill Gardens, Southampton Road, Salisbury, Wiltshire, SP1 2LW. See Course page for more details. Salisbury parkrun needs you! It is entirely organised by volunteers - email salisburyhelpers@parkrun.com to help. Where is it? It's run in Lydiard Park. See Course page for more details. Swindon parkrun needs you! It is entirely organised by volunteers - email swindonhelpers@parkrun.com to help. Where is it? It's run in Southwick Country Park, Trowbridge, Wiltshire,. See Course page for more details. Southwick Country parkrun needs you! It is entirely organised by volunteers - email southwickcountryparkhelpers@parkrun.com to help. Where is it? The event takes place at Marlborough Common, Marlborough, SN8 1DL. See Course page for more details. How fast do I have to be? We all run for our own enjoyment. Please come along and join in whatever your pace! Marlborough Common parkrun needs you! It is entirely organised by volunteers - email marlboroughcommonhelpers@parkrun.com to help. We're friendly! Every week we grab a post parkrun coffee in the Marlborough Golf Club bar - please come and join us! It is only for juniors - if you're not a junior, how about trying one of the weekly Saturday parkrun events? What is Chippenham junior parkrun? It is a 2k run for juniors only (4-14 year olds). If you are not a junior please try one of our weekly Saturday parkrun events instead. When is it? It is held every Sunday at 9:00am. What does it cost to join in? Nothing - it's free! but please register before your first run. Only ever register with parkrun once. Don't forget to bring a printed copy of your barcode (request a reminder). How fast do I have to be? The aim is to have fun. Please come along and join in whatever your pace! We're friendly! Every week we grab a post parkrun coffee in The Tenth Hole Tea Room, Monkton Park Golf Course, Monkton Park, Chippenham, SN15 3PE - please come and join us! parkrun is able to offer hundreds of free events across the country every week thanks largely to the fantastic support we receive from our partners. Our partners are an extremely important part of the parkrun family, which is why we select them so carefully. Each of our partners has a deep understanding of the culture and ethos of parkrun and the values that are close to our heart. That’s why we are proud to support them in return. parkrun aims to have an event in every community that wants one. Want your own parkrun event in your backyard? Read on. We'd be delighted to work with you to set up and manage a parkrun event in your own backyard. All that you need to start this wonderful journey is some determination and drive. We will help you with the rest of the process offering a step by step guide, assistance and support. Don't believe us? Why not ask any of the existing events for a reference? Each event is independently managed and controlled by the event director and so their reference is very important. If you wish to talk to them directly, go to the event website, find the event directors email address and write to them directly. However, if you would like to hear from us then send us an enquiry and we'll get back to you very quickly.